SYDNEY Swans champion Adam Goodes planned to retire when he stepped away from the game midway through the season, but says the support he received from his club and supporters made him return to the club. Goodes took personal leave and missed the Swans' clash against Adelaide in round 18 at the SCG after the constant abuse he had received from opposition fans had him mentally shot. The Swans players showed their support for their missing mate by smashing the Crows by 52 points, while Swans fans turned the love meter up to extreme to show just how much Goodes meant to them. Supporters stood as one for the seventh minute of the third quarter - in reference to the dual Brownlow medallist's number – to give Goodes a rousing round of applause that lasted over a minute. Speaking at the Swans' best and fairest in Sydney on Friday night, Goodes says he would have quit if not for the support he saw that night. "I didn't want to come back and play footy, it was a tough situation," Goodes said. "I was eight hours out of Adelaide, we were lucky to get the game on TV, but to see our supporters who have stuck by me for the longest part of my journey and have always been there to support me, and this football club, that was the reason I wanted to come back. "I knew I'd be protected and supported by the people in this room and it was a very special moment for me. "There was no way I thought I'd come back from that but I'm glad I did because this football club means a lot to me and it's given me a lot of strength and a lot of good memories, memories I'll have with me forever. "To see the supporters and the love and the way the boys played that day really showed me how much I meant to them which was really beautiful." Swans coach John Longmire said Goodes will go down as one of the greatest players the game has ever seen, as well as one of its greatest athletes. "At his best Adam Goodes was quite simply unstoppable," Longmire said. "His combination of talent, athleticism, speed and size meant that not one player in the competition could match up on him." But Longmire said that Goodes' natural ability meant that his toughness – both mental and physical - was often overlooked. Longmire pointed to the injuries he had shrugged off over his career as proof of how durable and courageous he was, none more so than the knee injury he suffered in the first half of the 2012 grand final against Hawthorn. 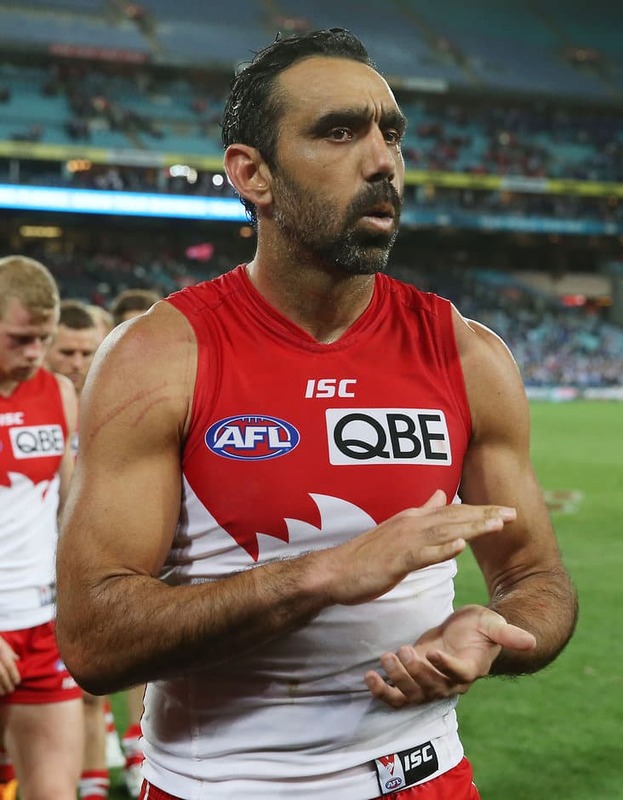 Goodes damaged the posterior cruciate ligament in his left knee before half-time but battled on to help the Swans to a stirring upset win over the Hawks. "Our doctor had told me it was a major injury (but) after the third time of me asking him how his knee was at the half-time break, he looked me dead in the eye and said 'look, I'm alright,'" Longmire said. "Not only did he keep playing, but who could forget his goal that put us seven points up in a tense last quarter. "The injury was so serious he didn't run again for the next 12 weeks." Goodes plans to travel with partner Natalie for the next two months overseas before spending Christmas in Sydney with his family, and he said he will think about life as a retiree in the New Year. "I'm not disappearing, I'm not dying, this football club is something I want to be a part of for the rest of my life," Goodes said. "I can't wait to sit on Bobby Skilton's table and drink as much booze as possible with Barry Round, because those guys are why we represent this football club."